We will see how many people actually pay attention to these ramblings. Well, today is my birthday. Happy birthday to me. 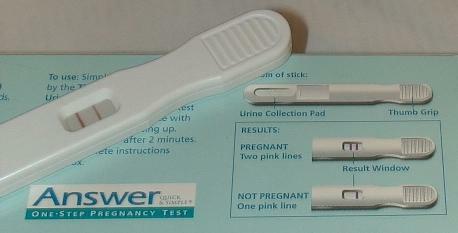 This morning my wife took one of those home pregnancy tests. According to this measure, we are starting down the road to the rest our lives and in nine short months will be expecting (knock on wood) a screaming dripping upset person, and maybe even a daughter or son. Are you sure that there are two lines? Oh, and notice the cool (and convenient) "Thumb Grip". Yes, the test came back with two lines instead of one. Interesting that all it takes is such a trivial difference which sets the heart moving a bit quicker and the brain whirling a bit faster. Don't get me wrong, Ro and I had been talking about this for a long time and had decided, for some reason, that now was the time. At 35, she's getting into the age bracket where the number of tests triple and her doctor wants to make sure, when nothing is happening, that she still does want to have children. Translation: get on with it. Well, I won the bet. Ro said that given our ages (like we are 70 or something), my biking (like I wear my biking shorts every day), my working on computers (like I stradle the monitor), and other factors that it would take at least six months for the big C to occur. I was a little more pessimistic optimistic and said that there was no reason why it wouldn't work the first time. My prize? A visit from the stork in nine months (more knocking). So kids, beware. Dr. Ruth (do you even know who she is) was correct. Unless you are ready to have children, you should always use protection -- you know, condoms. Although it can sometimes be difficult, it is often far too easy to conceive when you least expect it. I know that even though I have known about it for less than six hours, I still think about Ro's stomach a lot differently all of a sudden. Translate: let's be careful out there. No one knows right now. I know its on the web, but I can check access logs to see when someone does read this. What a secret!! The future grandmothers are going to go crazy. And so it begins -- the rest of our lives. Tell me again why we are doing this?